★ 100% brand new with high quality, made with high quality black rubber foam, 98 inches front bumper rubber spoiler. ★ Flexible and lightweight foam rubber install in minutes using ultra strong 3M automotive tale. Instruction of installation is included.Professional installation is highly recommended. ★ Gives your ride a more agressive and customized look! 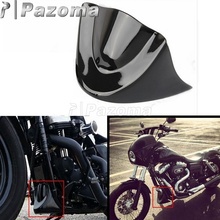 High performance racing style,flexible enough to conform to different types of bumper/car body. ★ Protect your car from scratches/bump and any undesired damage caused by a collision. ★ Universal fits for most cars,trucks,SUVs . Stick it on front or rear bumper, body kit, side skirt, tail fins ,etc. FUNCTION for Bumper Lip! 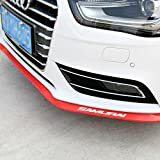 Protects your front bumper from scuffs and scratches and Co-existence of fashion and protection to enhance the overall sense of sports can effectively protect the car. 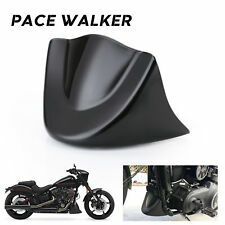 Offers a unique and lowered look while protecting your vehicle from curbs and scrapes，Flexible enough to conform to different types of bumper/car body Protect your car from scratches/bump and any undesired damage caused by a collision. Brand new and high quality100% Imported Carbon Fiber Materials Bumper spoiler, Flexible, Durable, Soft, Waterproof, Can Protect Car Paint Won't Scratched, Let Your Love Car to More Better,Specifically designed with style and durability in mind..
FITMENT for Front Bumper Spoiler! Fit for most of cars,truck or SUVS.You can stick it on front or rear bumper, body kit, side skirt. 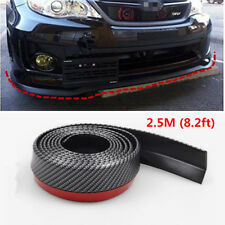 Easy to Install --The length of the bumper protector is adjustable to your cars. The degree of adhesion can be chosen (adhesive or screw).In order to achieve better adhesion,we recommend the use of screws.2 pack of cleaner, adhesive and screws are included. (Remember: the front lip of the car must be equipped with self-tapping screws after it is installed. Because the car is in great fluctuation, the screw will make the product more solid and will not fall off.). 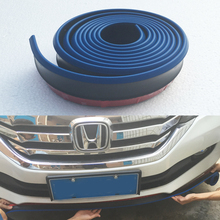 Easy to Install --The length of the bumper protector is adjustable to your cars. The degree of adhesion can be chosen (adhesive or screw).In order to achieve better adhesion,we recommend the use of screws.2 pack of cleaner, adhesive and screws are included. (Remember: the front lip of the car must be equipped with self-tapping screws after it is installed. 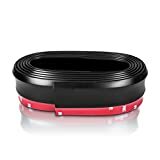 Because the car is in great fluctuation, the screw will make the product more solid and will not fall off..
100% brand new with high quality, made with high quality black rubber foam, 98 inches front bumper rubber spoiler. Flexible and lightweight foam rubber install in minutes using ultra strong 3M automotive tale. Instruction of installation is included.Professional installation is highly recommended. Gives your ride a more agressive and customized look! High performance racing style,flexible enough to conform to different types of bumper/car body. Protect your car from scratches/bump and any undesired damage caused by a collision. Universal fits for most cars,trucks,SUVs . 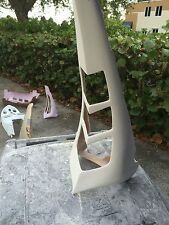 Stick it on front or rear bumper, body kit, side skirt, tail fins ,etc. Note:Vehicle version have difference in different region.This is aftermarket replacement item but not OEM part. Condition: 100% brand new w/ high qualityMaterial: high quality black rubber foamLength：98 inchesFeature:1.Flexible and lightweight foam rubber install in minutes using ultra strong 3M automotive tale(PRE-APPLIED).2.Gives your ride a more agressive and customized look.3.High performance racing style,flexible enough to conform to different types of bumper/car body.4.Protect your car from scratches/bump and any undesired damage caused by a collision.5.Instruction of installation is included.Professional installation is highly recommended.Fitment: Universal fits for most cars,trucks,SUVs Stick it on front or rear bumper, body kit, side skirt, tail fins ,etcPackage includes: 1x front bumper spoiler (3M tape attached)Notice: Package will be ship out within 1 business days after payment cleared.Please allow 7-15 business days for united states orders.And transit time is best estimated but not guaranteed as transit time varies. FUNCTION for Bumper Lip! 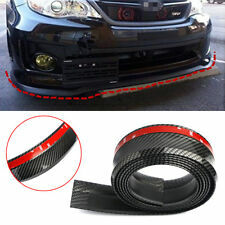 Protects your front bumper from scuffs and scratches and comes with double-tape and screws for installation. In order to achieve better adhesion, we recommend the use of screws. 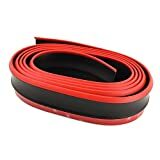 Flexible enough to conform to different types of bumper/car body Protect your car from scratches/bump and any undesired damage caused by a collision. 100% Imported Carbon Fiber Materials Bumper spoiler, Flexible, Durable, Soft, Waterproof, Can Protect Car Paint Won't Scratched, Let Your Love Car to More Better,Specifically designed with style and durability in mind..
Quick and Easy Installation car spoiler, Low Cost Way of Packaging to Protect Your Car, Build a Running Car, Let Your Car Looks Cool(Remember: the front lip of the car must be equipped with self-tapping screws after it is installed. Because the car is in great fluctuation, the screw will make the product more solid and will not fall off.). Fitment:Universal fits for most cars,trucks,SUVsStick it on front or rear bumper, body kit, side skirt, tail fins etc Material:High quality black rubber foam Style:1x Black lip valance(3M tape attached, just peel and apply) Size: 100 Inch FEATURE Flexible and lightweight foam rubber install in minutes using ultra strong 3M automotive tale(PRE-APPLIED). 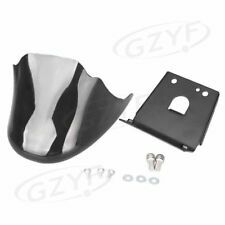 Gives your ride a more agressive and customized look No special too, no drilling or screws required. 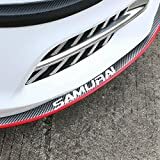 High performance JDM racing style Instruction of installation is not includedHELPFUL TIPSClean the underside of the bumper with rubbing alcohol on the location the lip will be attached. 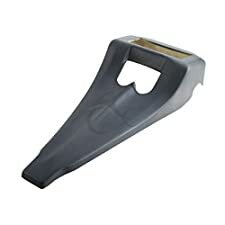 This will ensure a strong bond with the bumperPeel the backing off of one end of the lip. Position the tape so that the lip is protruding towards you. Install on the underside of the bumper starting at one end of the bumper. 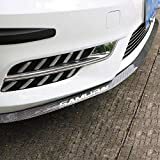 Make sure to press firmlyContinue to peel and attached to the rest of the bumper making sure the lip is even as you doCut off the excess with scissorsNOTE: If you need a stronger, more permanent attachment, you amy use self-taping screws to secure the lip to the bumper.